It's a rainy Monday morning and Winter cometh. But I'm not gloomy about it. But I don't mind the winter at all. Bring it on I say. The stage hires have more or less ended, I haven't gone for a panto this year, so I can spend time with the family, which is a bit of a luxury for me as I've been working away every Christmas for 8 years. "Obviously, if a lucrative job came up I'd have to think twice, but it hasn't as yet, so I'm quite pleased." My company represents Ray Galton and the late Alan Simpson scripts, so that's always ongoing and we also have corporate acting work on for various companies which tend to ramp up in the winter. 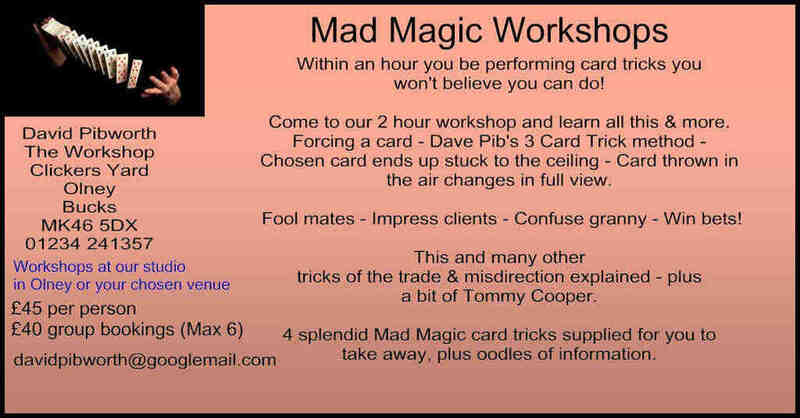 Of course, our online magic shop is always busy, so plenty on, but all controllable, and this is a big deal for me, as it leaves a bit of time to work out some new magic gags (I'm devising how to push a playing card through a window) and to get on with my sitcom, which I confess to having sidelined for a number of more immediate projects. Also, winter means that my colleagues and I will be able to get on with clearing the area for the new Arches Theatre in Clifton Reynes which will be opening in August 2018. We're also re-arranging the storage I have where we keep the sets required for MK Theatre of Comedy and Etc Theatre Company. there are just too many distractions such as rehearsing, performing and also having to run my other work from some bed and breakfast or digs in the Isle of Wight or wherever I happen to be contracted to. I might even be able to watch The Sound of Music over Christmas with my feet up, not thinking about the next performance. I may well have a party at my gaff. I might even arrange some winter snooker tournaments at The Winchester Club, which for those of you who don't know is the room above my garage where we have a snooker table, a Tuk Tuk bar full of booze and the coffin from the stage show of Steptoe and Son full of crisps, pickled eggs and pies. "So I like the UK in the winter, boosted no end by knowing that we're leaving the EU and I don't have to negotiate it." How I enjoy all the sanctimonious comments on Facebook, and this Christmas will leave me time to enjoy them even more and irritate a few vocal Remainers at the same time; a fun, yet harmless hobby of mine. So it's sunny all round for me, even if it is snowing, and I do hope it does as sledging down Clifton Hills on Boxing Day with my daughter and her pals will just about put the icing on the cake for me. I'll try to be more gloomy next week.